Back in the day, people knew how to do cool things. Well, I think they’re cool. Quick note: Before we get started, I wanted to let you know that I made a printable recipe card just for readers of this post. If you want it, You can click here and I’ll send it right away. Well, really, I can’t be the only one in the world that thinks it’s exceptionally cool to cure pork belly and have it hanging in your kitchen. A few weeks ago, we butchered our pigs, and have been enjoying the fruit of our labors. And man, oh man, oh man, ohhh man, is it delicious. And just a few days ago, we were finally able to consume our much awaited bacon and pork cheeks. For the past two weeks, it’d been curing in our refrigerator – slowly leeching itself of water and stabilizing for long term storage. The process was simple. But new to me. Because I’m from this day and age, when doing cool things like curing pork belly and having it hang in your kitchen is not common knowledge. Luckily, I’m not afraid to learn new things. Nor am I afraid to try them. Some of the greatest experiences in my life have come from trying new things. And thus, I learned. And tried. And succeeded! Thanks in part to this wonderful post from Reformation Acres and also in part to the wonderful Farmstead Meatsmith and his beautiful wife, Lauren, who has been helping assure me along my way. Because to learn cool things you need help. And I’ve been blessed with the most wonderful bacon-loving helpers an ‘ol farmgirl could ask for. Before you get started, don’t forget, I created a recipe card just for readers of this post. If you want it, I’ll send it right over – just click here. – Fresh pork belly from the best quality hog you can find (if you can’t grow your own pigs yet, try and find a local pork farmer! or talk to a high-quality local butcher). 1. Combine the sugar and salt. Generously rub the flesh side of the pork belly with the mixture. 2. Rub the sugar and salt into the flesh some more. 3. Did I mention you need to rub the ‘ol pork belly down with the sugar and salt? The sides too. Make sure to get any pockets or under bits of fat – anywhere where water could accumulate. All of it, man. 4. Stack the pork belly slab (or slabs) into the large plastic bin. Stick in the refrigerator and forget about it until the next day. Dump the accumulated liquid out of the plastic bin and rerub the flesh with the sugar and salt. Stack it all back in the tub and stick it in the fridge again. 5. The next day, dump out any accumulated liquid and rub the sugar and salt mixture on any part of the pork belly where the salt and sugar has been completely dissolved. A thin layer will do. Repeat this process every day until liquid stops accumulating in the bin. Ours took about 10 days. 6. Rinse the pork belly under water, using your fingertips to scrub off any remaining sugar and salt. Pat dry. 7. Voila! Cured bacon. 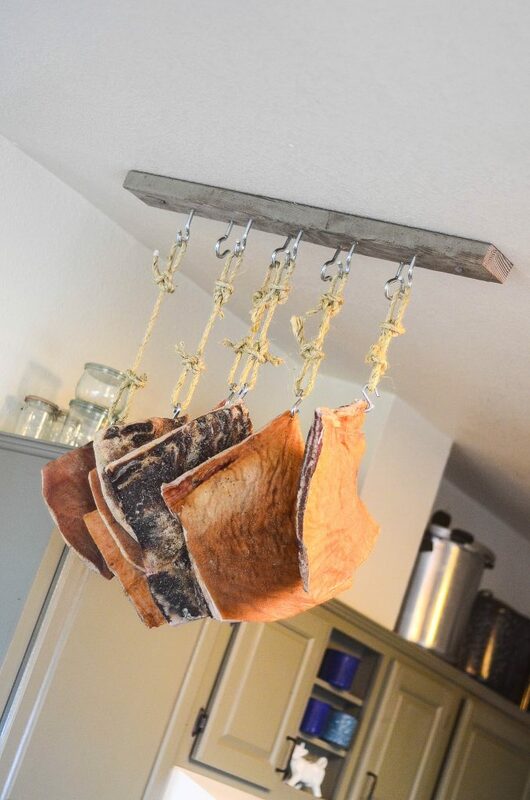 We ran meat hooks through ours and hung it up in the kitchen. Waiiiit, Shaye, what was that you said? You hung it up in the kitchen? Won’t it rot? The dry salt curing takes care of the bacteria in the meat. As the bacon sits out, the surface dries out, and this prevents new bacteria from forming. It’s incredibly, really, that the salt can make the meat and fat stable at room temperature. Think of it just like a meat jerky – but not quite as hard (same concept). We’re simply using salt and air to moderate bacteria growth. The bacon will last for months at room temperature (though it will continue to dry out little by little as time goes on) and should be inspected daily for signs of rancidity or any insect problems. But how can I prevent insects from bothering my meat? Great question, reader. 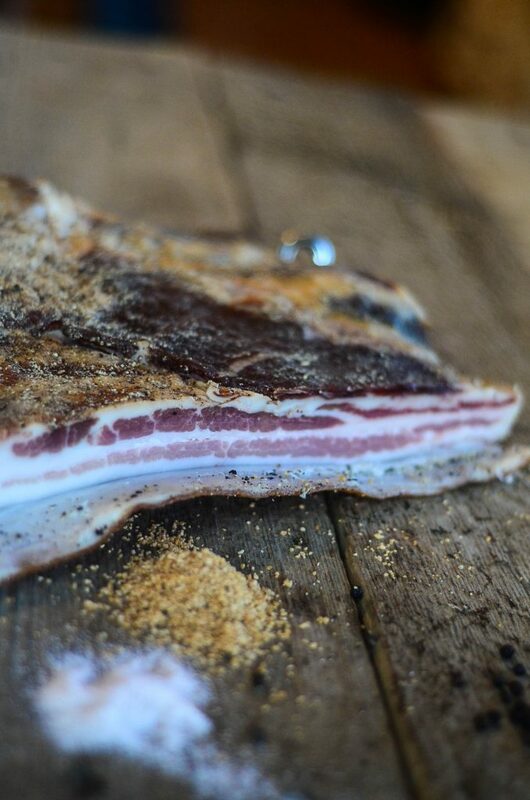 We have completely coated the flesh side of our pork belly with freshly ground black pepper. This has completely deterred the flies, thus far. On top of that, loosely wrapping the bacon slabs in a vey breathable cheese cloth (like this one) is another great water to deter any flies from landing on the meat. Should you notice any fly eggs, a quick rub with a clean washcloth that’s been dipped in vinegar is sufficient to clean up the pork. It may sound completely foreign to our refrigerator-driven culture to cure meats in such a way. But this was how it was done for thousands of years before the luxury of refrigeration. And frankly, I’ve discovered the taste to be unlike anything I’ve ever experienced. It’s like bacon. Times a million. The subtle flavors are much more pronounced and will only get better with a bit of time. These slabs of home grown, home harvested, and home cured pork belly hanging from my kitchen ceiling make me so happy, it almost puts me at loss for words. Learning, diligence, hard work, perseverance, and adventure is wrapped up inside of them. They represent our farm. Our journey. Our love for food. And not only food, but food that has a story. That has a meaning. Kicking back to these old school methods of preservation is a way of not only connecting with times past, but learning from it, and getting to be a part of them. It’s reconnecting with a lost knowledge and skill set that I believe still holds significant value. But my passion for this bacon is so serious, it’s caused some pretty intense emotions. One last thing: As I mentioned before, I did make a printable recipe card just for readers of this post. If you want it, you can click here and I’ll send it right away. I love this. Thank you for making it sound so SIMPLE! I am forever amazed by the things I didn’t know. You are aweome. And that bacon sure looks yummy! This is SO COOL Shaye! I want porkbellies hanging from my kitchen ceiling, too! This is so COOL! I’m even more excited about our 3 pigs due to be butchered early next year. I HAVE got to do this! 🙂 Thanks for sharing with us! Shaye, you’re so deep. Who knew that bacon could bring tears to the eyes? Now college just needs to end so I can get on a homestead with my hubbie and cure some bacon. I’m with you – it’s exceptionally cool!! You are totally keeping a lost art alive and making me drool at the same time. I love everything about this! This is too cool!!! Question for you! I was given a pasture raised fresh ham (when some gives you great meat for free you do not say no! lol), they told me it wouldn’t taste like the salty ham I’m used to because it hasn’t been cured…. Could I use this same method for a fresh ham? Or does this only work with pork belly? A ham recipe is forthcoming! I notice you did not use a “cure” in your recipe. In truth you only have salted pork belly. I hope you use a cure in the ham. In truth, the salt IS the cure. I’m not a nitrite/nitrate hater at all, but in this case, the salt is the curing agent. And you can completely and safely CURE meats with nothing more than salt. The term “cure” has lots of connotations and implications depending on the application. The most important thing when it comes to curing and preserving meat is to know what you are doing and why. And curing a rear leg with salt is perfectly safe if done properly… just ask the Italians and the Spanish. 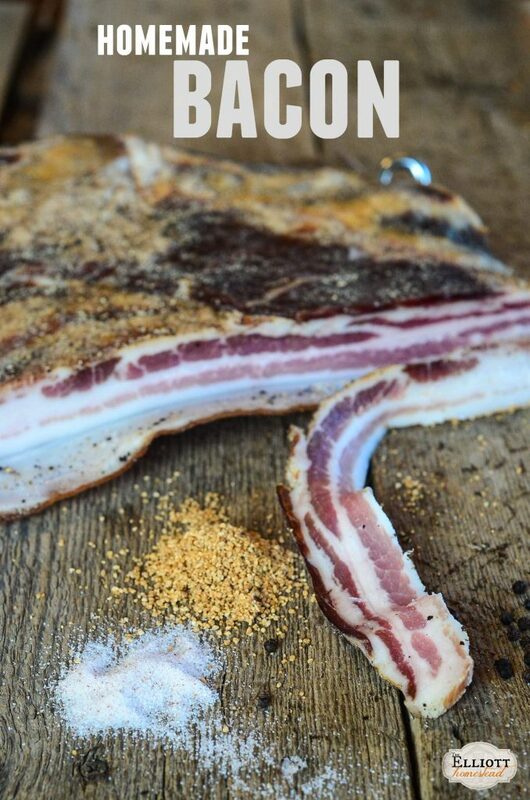 might one use this curing method making pancetta? I wonder how you would add smoking to the process? Smoke right after the curing process and then store as normal! Some of those look like the skin is on? Any tips on skin vs no skin? We left the skin on ours. Easier and it secures that side from any oxygen! 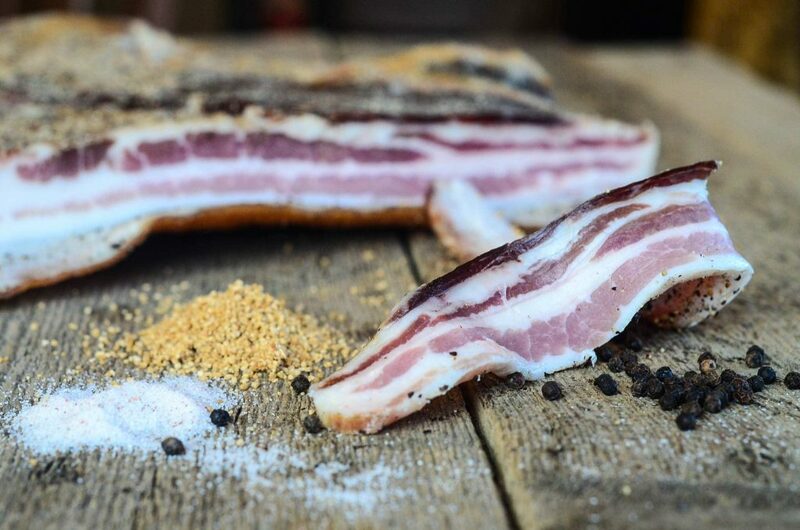 Can you cold smoke the bacon after it is cured? Yes, you sure can Bill! You had me until hanging it from my ceiling. Couldn’t one just refrigerate it after the initial curing and get the same outcome without hanging it from your ceiling? It just wouldn’t “fly” in my house (pun intended). Thanks for the post. You could hang the bacon in a cold cellar, or leave it in your fridge if you’re that terrified of germs & such. But this form of curing ought to provide no issues. Big businesses hang “Expensive” cured meats in this same manner. ???? I cannot find “Dehydrated” sugar per se., but I did find something called Rapunzel Pure Whole Cane Sugar. Is this dehydrated? Dehydrated sugar cane juice is just cane sugar. The cane juice is dehydrated to produce sugar *crystals*. I cant believe how incredibly simple that sounds…and I can only imagine how much better it tastes. We have lost so much through the generations. I aspire to be where you are at some point in my life. Can this be done with beef or other meats? (As we do not eat pork) And what cut of beef would you suggest? The beef bacon we buy from the locker is cured with nitrates/nitrites, really fatty and pricey. We would like to be able to do an uncured version and save some money too. If you are a city girl, like me, and supporting local farming is your aim, then there is a way to help get this type of bacon! A local farmer does this or a local Whole Foods. I know it sounds crazy, but my local WFs store cures their own bacon and it is OH MY GOODNESS GOOD! It is very expensive, but if you want to indulge, check out your local markets. how many pounds of pork belly does this make? I didn’t notice an amount. 1 pork belly? thanks. My slabs were about 6 pounds each. Trying this as we speak! that bacon looks delicious!! Seeing it stored in the ‘old fashioned way’ reminds me of how jamon is stored in Espana-just hanging out for the world to drool over. thanks for sharing! Just one question: How long does the Bacon store, after it is cut? I’m worried, that I have to eat all of it quickly, the moment I cut the first slice. We still have some hanging… and it’s been over 7 months! Can I use brown sugar instead of cane sugar? Can you replace the sugar with brown sugar? Do you use all of the salt/sugar (12 cups) at once then keep apply from the container after you drain it? Do you put the salt/sugar on the fat side or the meat side olny? Is it to be covered? Can it be left in a cooler place other than the refrigerator? I’ve started mine but an concerned I’m not doing it properly. The mixture goes on both sides. You won’t use all of it, just enough to cover the meat. I didn’t cover mine, but I’m sure you could if you’d like. A cooler place would slow down the curing. If say someone in the house was opposed to meat hanging in the kitchen, which I think is awesome… Once cured and smoked how would you store it and what would the shelf life be if not hanging? Cured bacon is stable at room temp. It will harden a bit. Use it within a year or cut it up and refrigerate it. Okay, trying to clarify the salt-to-meat ratio. 6 cups of salt to one 6 lb pork belly slab (1 cup per lb)? Or did you use 6 cups across all 6 slabs you have pictured (1 cup per 6 lbs)? From a different recipe else where, I used 2 cups of Kosher salt on a 4 lb slab (1 cup per 2 lbs), and it was way too salty. Basically, what is your formula for calculating the proper amount of salt to add to the meat? It’s not an exact science – we used enough salt to keep the meat coated with a very thin layer. It’s mixed with the sugar at a 50/50 ratio to prevent the bacon from becoming too salty. It gets too salty if it’s allowed to sit in the liquid that drains off – so be sure to drain it often. The bacon is dry-cured, which pulls the liquid out of the bacon, so no nitrates are necessary. But what about Botulism ? I’ll answer a lot of you with this one! Botulism needs a friendly environment to grow. Salt removes water from the meat, which all bacteria needs to survive. This salt/dry cure method has been used for thousands of years to preserve meat. What about Botulism though ? Hi Shane, probably a silly question. Can the cured pork belly be eaten without cooking? As a cold meat with pickles? Can the cured belly be eaten as a cold meat or does it need to be cooked? Ok, sorry if this sounds stupid :/ … do you cook it after its done curing in the fridge for the 10 days or so? Can you eat it right away after the 10 days in the fridge or does it have to hang for a while? Thank you! I can’t wait to try this in a couple months! How can it be ( completely foreign to our refrigerator-driven culture to cure meats in such a way. But this was how it was done for thousands of years before the luxury of refrigeration) yet step 4 is the first day of a ten day process of. Stick in the refrigerator and forget about it until the next day. Dump the accumulated liquid out of the plastic bin and rerub the flesh with the sugar and salt. Stack it all back in the tub and stick it in the fridge again.????? you don’t really need to refrigerate it. all it needs is a cool place and until the refrigerator, mankind stored food in a root cellar or spring house which was plenty cool. actually, i read that most of the curing took place during the winter months because there was no other way to keep it cool. a root cellar isn’t cool enough for the curing process. others have asked if you can use this same method for other meats. can you? All is fine but, NO SUGAR!!!! NO SUGAR for God sake!!! NO SUGAR definitely, only coarse salt and some spices, yes, but NO SUGAR!!!. Please elaborate! Why no sugar? Great job I am going to try this over the weekend.. I was wondering can I add spices like garlic, onion, paprika things like that? Thank you so much for sharing this. I love learning new things that they use to do back in the old days. Have a great day. Alrighty then… I’m in the throes of this. Currently at day six. I’m using a loin rather than a belly, and I guess I managed to confuse myself because I’ve been reading so much on the subject, but I somehow convinced myself to use a blend of Morton’s tender quick and salt and sugar in equal portions (150g TQ, 150g non iodized salt, 150g brown sugar to treat 2.2 kg loin). I rubbed about a third of the cure onto the loin and set it in the fridge in a container with drainage, adding a bit of cure and flipping each day. I’ve run out of cure by day six, and the loin seems to have given off most of it’s moisture. Wondering if I should wrap it now, and let the remaining liquor remain in contact… or should I continue to let it dry? Should i do up more cure? Or is what I’ve got sufficient? There’s thought out there that the brine needs to be in contact with the meat to be truly effective. Sorry if this was already mentioned. I understand that homesteaders packed this in their wagons. What options are there for long term storage without refrigeration? WELL! i saw dry salt cured bacon on the turkyfoot llc website, but blimy mate….they want about $11 for 2 pounds! now thanks to you i can make my own and if vacuum sealed, it should last for a year or more. especially if left in the coolness of the root cellar. cheers mate! oh i forgot, my mam and dad knew a canadian trapper who had a deer ham hanging in his kitchen that was cured like you described here. funny thing is, that ham was a year old and still edible. they tried it and she told me it was pretty scrummy. Loved your post. I read on a site that in one of the old countries that when a girl child was born a ham was cured in her honor. When she married it was served at her wedding. Interesting. It may sound like a dumb question, but once dry cured and air dried, is it safe to eat as-is (without being cooked)? My grandparents and father used to cure/dry meats in the winter and we’d look forward to sitting around in the cold evenings and snacking on the fruits of their labor…especially the bacon! I’d like to try my hand at this – especially since it’s refrigerator dependent. I just finished curing mine today. It tastes good but it is incredibly salty. I emptied the liquid in the plastic bin daily but maybe it got into the meat since it was laying flat in the bin. Maybe next time I’ll find a way to suspend it so the liquid doesn’t touch the meat. I am 59 and I grew up helping my grandmother do this to all our bacon and hams it is awesome that someone is carrying it forward I thought that I was the only one still doing this today. I love to carry on what my grandmother taught me as I grew up!!!! Thank you oh so very much!!!!!! Hi Ben! It sounds like you let it leach for too long – a common mistakes the first few times that you do it. Our temptation is always to over do it! You CAN soak it in water to help leach extra salt out. WOW – SCHWING ! ( Sorry so 90’s but had to keep it PG )… I’ve done bacon a few different ways, mostly dry cure in a zip lock bag for 7-10 days, then cold smoke. IsI’d like to try this method – is there a spot in time for smoking it ? Lastly – the above post regarding too salty – what exactly was done too long ? Can you smoke your recipe and at what point do you think the smoking would take place ? The above pot – ‘Ben’ – what do you mean he let it leach too long ? Thank you ! Making home made bacon has been such a rewarding process – soooo yummy ! What I would suggest for readers who use this method and the bacon turns out too salty, just keep the bacon skin side down in the container – the skin is much harder than flesh so it will be harder to absorb salty liquid. I am using this method for curing pork loin and it comes out exceptionally tasty as a cold cut for any sandwiches! – 2 cups each sugar/ salt mixture use every day on raw pork loin and cure for 7 days. Thanks for this! We just butchered our pigs yesterday. This article does a good job of making clear how simple the dry curing is! Thanks! I’m glad you enjoyed our post! I would suggest to put the port on some kind of small rack during the curing process, so the draining liquid does not penetrate the meat? Comments? Yep! That’s a great idea. I cut up a milk crate and used all 4 sides and the bottom as “mats” to cure pork on and keep it from sitting in the juice. Have you or anyone else tried this with salt only? I currently don’t tolerate sugar and I’m not a big fan of sweetened meat. are used to make my own jerky and I never used sugar and I really liked how mine came out. I sent an email with the same question, for some reason I didn’t go to the end of the comment section here and see that you’re actively responding. So feel free to ignore my email so that other people can see your response. since other people who followed your recipe still had trouble with the result being too salty. If I use only salt I would think I might be more vulnerable to over saltification. Any comments or suggestions would be greatly appreciated. I have two pork bellies but I also have 8 pounds of pork belly that are cut into bacon size strips. Is there any reason I can’t do the same thing with them? The sugar is primarily to cut the salt because the common mistake is to overcure the bacon. You don’t taste the sugar when it’s all said and done – it’s very salty. It’s not about the taste with the sugar, I have Candida issues so I can’t tolerate the sugar at all. I will give it a try with just the salt and see how it goes. after you slice your bacon and cook a piece to see if your bacon is too salty , if so you can soak it in milk over night to help pull out some of the salt. I remember my grand dad doing that for salty ham. Candida try yeast cleanse by solarat. I use this for yeast or candida. I hope this post isn’t too old to comment on and get a reply. I need your help here, Shaye! I’ve got my pork belly caked in sugar and salt. After the first day, there was a pool of liquid in the bottom of the bowl. I drained it and packed more salt and sugar on. Today is the second day and nothing! No liquid drained out and it looks the same as it did yesterday… Is it possible I used too much salt and brown and the liquid just isn’t permeating through? I really caked it on… figured more would be better lol. Help! Nope, that’s normal. Give it time. It’ll be fine! I know it says Dehydrated Whole Cane Sugar, I got a lot of Organic Raw Cane Sugar from a friend. Can that be used or should I buy the Dehydrated Whole Cane Sugar. I hope I am not to late to ask a question. My or my we have 5 pigs that we will butchering soon. We are keeping two of them, lots of work and just want to get it figured out. What temperature is too warm to cure using this method? I would like to do this outside in the garage. What is the max temperature that you can cure the bacon? There is not enough room in the fridge. Can it be done outdoors or in a garage? Yes, I imagine you could. Anywhere nice and cool. I don’t know an exact temperature. Sorry if you answered this already but no time to read all the comments on this busy farm LOL. I made this last month and it turned out beautifully except that it was too salty (same thing last time I made it). I covered it well because I was nervous about not preserving it well. We just finished our first batch of bacon! Your instructions are so simple and clear. Who knew it was so easy? We used a large foil roasting pan and covered it with foil. It took 14 days for the refrigerator process. We had our first taste yesterday and it was amazing! Partly due to ordering our pork belly from White Oak Pastures Farm in GA. We plan on buying hogs next year. Not only did we make the best tasting bacon EVER, but I now have the best tasting bacon fat to cook with! Because we live in Florida and have high humidity, we won’t hang our bacon to finish drying. We’ll continue to refrigerate it and freeze some. Am also giving 1# slabs to family for Christmas. This was also much cheaper than buying at the store even when factoring in the cost of the pork belly and all the ingredients. Thanks! Oh, I can’t wait to get your cookbook. Am ordering it today! Can you please answer a question? I made the bacon about 4 mos. ago.- all looked amazing (except a little salty). It has been curing upstairs in a closet. It is coll up there. It has become very dried out and hard to cut although still tasty. Is this normal?? Shaye, I need a bit more clarification: the salt and sugar mixture is just a rub, not a full container you are nestling the belly in, correct? When I cure egg yolks they are nestled into a full container of salt/sometimes sugar. That’s not what you are doing, right? Thanks for the help! Tried your recipe and added paprika and dried thyme. I found it to be to salty, how long did you rinse after the dry curing and do you have any suggestions on making the finished product less salty? Mine is just finishing curing in the fridge, since temperatures are getting a little warmer now… I cut the skin off following the advice of another source, and it was a pain to do… BUT we had crackling!! Still not worth it, though, in my opinion. I hope it doesn’t come off as a silly question, but tossing the resulting syrup seems rather wasteful to me. All that sugar and salt! (And thyme!) Does anyone have an idea of what to do with it? Is it okay to eat this raw (as one would a cured ham) or does it need to be cooked? Love the recepie! getting very hard to find really good smoked, cured, salted and preserved pork and beef around here. We’re scared of our own shadows now. Unfortunately, link for recepie card did not work. Last year we butchered our first pig that had been “growing” on a friend’s property. We saved the pork belly to make bacon, but that means it’s been vacuum-seal frozen for about a year. I’ve been scouring the internet looking at different bacon-making methods/recipes, and wondered if my process would be different than yours, after letting the pork belly thaw, or if you have any experience with it? I’d like to get started to have some homegrown bacon for Christmas festivities, and I don’t want it to be a flop haha. My procrastinator self is out on the internet getting some opinions now. I am looking forward to the cured ham information! rheumatism, and recurring infections. Strain by pushing the juice out in the crabs using the back of an ladle. Hey there! Thanks for this wonderful post! My in-laws actually had Farmstead Meatsmith come to their house and give us all a hands-on teaching course in butchering and the cut/wrap. It was a really neat experience! I was actually trying to find the instructions for dry-curing bacon on their website ( I couldn’t find it), but instead I found your post! The only question I have is this: can I use a defrosted pork belly or does it need to be fresh? I usually do all the meat processing myself, but this year we ended up having to go out of state for my husband’s work the day after we had the pigs slaughtered so we payed a friend of ours to do it. Anyway, the butcher froze the belly slabs whole for me. My sister-in-law (she has dry cured meat like mentioned in your post) thought that freezing might change the outcome of the dry-cure? Any thoughts? Thanks in advance! It’s so fun to see people doing things the old-fashioned way! Keep up the good work!